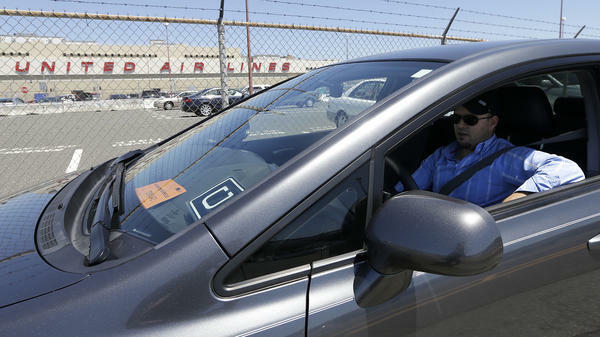 Uber driver Karim Amrani sits in his car parked near the San Francisco International Airport in July. "So if you think about it as a simple popularity contest, Uber is much more popular than using rental cars or taxis," Neveu says. While ride hailing has put some cabs completely out of business, Neveu doesn't think rental cars face the same fate. "There's always going to be a need for that marketplace when you have to drive longer distances, farther away," he says. Technology analyst Alexandra Samuel says the car rental industry needs to catch up: People don't want to be locked into a reservation days in advance. They want convenience (an app that knows your credit card number, not a form that makes you type it); they want to write emails in the car. Samuel says incumbent companies — take Hertz, for example — should consider offering rentals that come with drivers. And she asks, "Why do I have to go to a Hertz parking lot and pre-book and make sure there's a car there? Why can't I just use a Hertz app and find a Hertz car anywhere in the city?" Automakers are moving in that direction. General Motors plans to announce Thursday that it's rolling out a new car rental service called Maven, starting in Ann Arbor, Mich., where customers can use smartphones to reserve nearby cars and get in without keys. Earlier this month, Lyft announced a new partnership with General Motors that includes a new service for Lyft drivers to rent vehicles, instead of using their own. And we are learning more about why ridesharing companies like Uber and Lyft are so popular. There's new data suggesting that suits - professional people - are relying on these services heavily - so heavily, in fact, it's becoming the new normal, as NPR's Aarti Shahani reports. AARTI SHAHANI, BYLINE: A new normal, as in replacing an old normal. Say you landed at O'Hare Airport - Chicago. You've got a work meeting twenty minutes away. You might head to the rental desk to pick up a car, or you might call an Uber instead. ROBERT NEVEU: More transactions coming through our system are in Uber than there were in all the rental car transactions. SHAHANI: Bob Neveu is CEO of Certify, a company that businesses use to book travel and track receipts. NEVEU: So if you think about it, it's a simple popularity contest. Uber is much more popular than using rental cars or taxis. SHAHANI: Certify has analyzed millions of client transactions. That's all business travel. And in the last quarter of 2015, rental cars were 39 percent of total rides, compared to Uber, which was 41 percent - two points more. Taxis lag behind at 20 percent. While ride hailing has put some yellow cabs completely out of business, Neveu doesn't think that rental cars face the same dark fate. NEVEU: There's always going to be a need for that marketplace when you have to drive longer distances, further away. ALEXANDRA SAMUEL: Why do I have to go to Hertz parking lot and pre-book and make sure there's a car there? Why can't I just use a Hertz app and find a Hertz car anywhere in the city? SHAHANI: Automakers are moving in that direction. Today, General Motors announces they're rolling out a new car rental service called Maven, starting in Ann Arbor, Mich., where customers can use smartphones to reserve nearby cars and get in without keys. Aarti Shahani, NPR News. Transcript provided by NPR, Copyright NPR. Dallas Area Rapid Transit’s collaboration with online car services – Lyft is the latest – is a national first. Dallas transit users can now complete their door to door trips with help from these ride-share service applications that show up within DART’s own app. Shoppers can order just about anything on their smartphones – and now, just about anyone can deliver it. Amazon recently launched a service in Seattle called Amazon Flex, which out-sources deliveries to anyone with a car and an Android phone. An Austin company launched its own app in 2011 called Favor. Five stories that have North Texas talking: really old dinosaur bones are discovered in North Texas; in Dallas, Uber is beating taxis among business travelers; watch a Dallas Zoo giraffe give birth; and more. Months after controversy erupted, the Dallas City Council on Wednesday approved new rules that will regulate Uber, Lyft and other car-sharing services in the city. The vote was 13-2.